Day Six of the Online Card Class on Rainbows was for three techniques that did not fit into the categories presented on days 1-5. 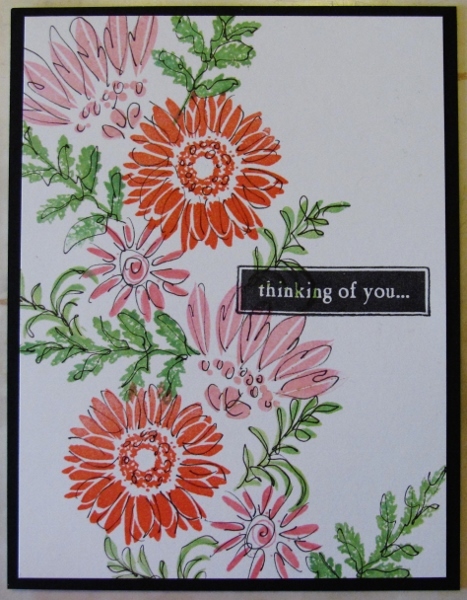 First up was Kristina with using a rainbow of liquid dots to create flowers around a stamped sentiment on a white card. I didn't have the materials she used but I had a whole rainbow of Stickles so I set about making flowers with those. I used dots, lines and teardrops to create these sparkly bits of deliciousness. I liked this so much, I made a second card. Both were cut a little larger and mounted on shimmery yellow card bases. Then Laura had us stamp (mask and stamp again) a large floral and color it with Copic markers. She showed several ways of arranging the rainbow but I really prefered this version with each flower head as its own rainbow. I colored a white diecut word t match the orange hues. I went over all the lines with a Sharpie and added dots with a white pen to the stamens. I skipped the third lesson, although I do plan to do it at some point (using acrylic paints on a gelli plate). Don't know what is planned for the 'wrap up day'. And then the class will be over. We're on to day 5 of the Rainbow Maker Online Card Class. I skipped using the lessons offered by Kristina and Laura, just completing several taught by Jennifer. These took a lot of time to dry (overnight) whitch explains the delay in posting. For the first card we were instructed to use watercolor markers in stripes on watercolor paper, spritz with water and let blend to one side. After drying with a heat tool we used a stencil and texture mousse applied with a blending tool. I did not have any mousse so I used a palette knife to apply Heritage Handicrafts Dimensional Paint in Snow White. Part of the directions, after completing all the backgrounds were on ways to layer white diecuts for elegant embellishments. Technique two was to create a radiant blend using only three colors blended in concentric circles. I used a semi-glossy cardstock which made the colors more pastel. Jennifer then used glitter paste through a stencil in a radiating pattern. I had neither a radiating stencil or glitter paste so I used some modeling paste that dries semi-transparent. The sentiment is three stacked white diecuts. This faux watercolor is applied with Distress Inks and a blending tool then spritzed with water to allow it to blend when held to one side. After drying with a heat tool a stencil was laid on it and Versamark ink pressed through the holes. I did not have irridescent embossing powder like Jennifer used so I went with gold. 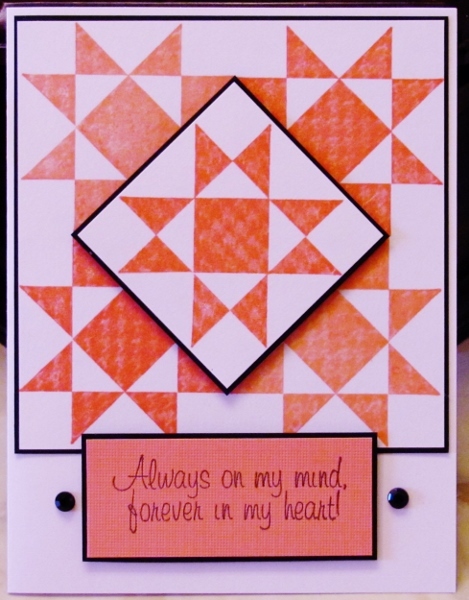 I added a white diecut panel and one of the leftover sentiment diecuts from day two. The next card starts out with a soft rainbow applied with blending tools. After thoroughly drying with a heat tool, a stencil is laid on and Versamark applied over the whole exposed surface. Mine was a reverse stencil so the Versamark actually ends up on the background. She embossed with clear sparkle embossing powder but I only had regular clear. After cooling, another layer of Distress Ink is blended on the rainbow which darkens where the stencil covered. I did my original rainbow with lighter colors and the ending one with brighter colors to make the distinction even more apparent. I finished off with stacked diecuts. After finishing the lessons I had parts left over so I used them to create a bonus card. One more day of class - I'd better go get busy. Online Card Class - Day 4 - For these lessons we dug out our watercolors. Actually, we had some choices in what we wanted to use for watercoloring supplies. I used my Windsor Newton watercolor paints for some and Distress Inks for others. All the cards were made with watercolor paper. Kristina taught watercolor blending skills. We created a background and then diecut words from it and mounted over white cardstock. The letters that were popped out from card one found a new home on black cardstock along with some gold peel-off stickers. Laura demonstrated using Distress inks on acrylic blocks to smoosh color bands onto watercolor paper. I added text pre-printed on vellum. Next, we were invited to apply these same colors in a circle on a sandwich bag, spritz with water and smoosh the card onto it. 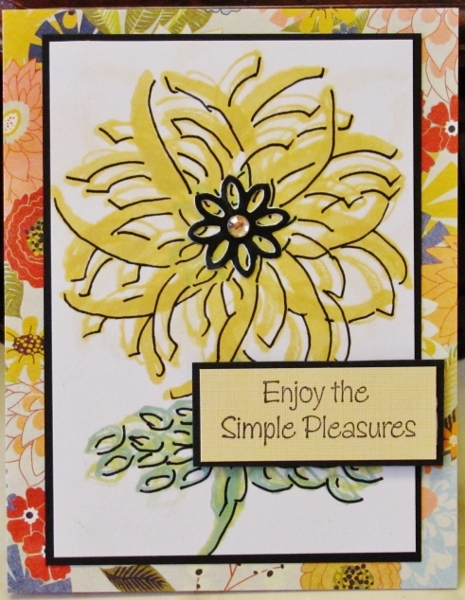 A white diecut medallion was combined with a pre-stamped sentiment strip. We then did the same technique using a non-stick craft sheet for inking. 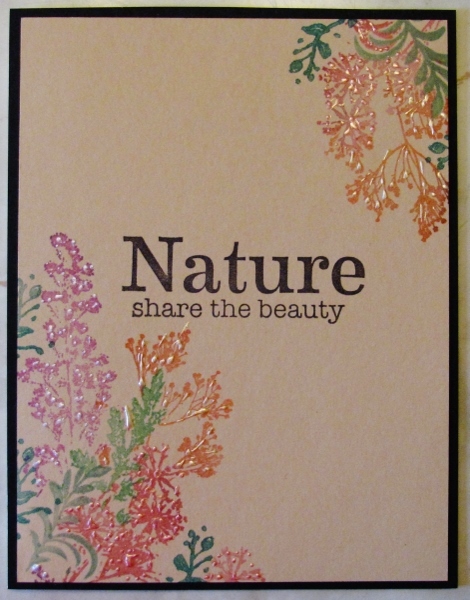 Laura next showed how to create a resist background using Versamark ink and clear embossing powder. The craft sheet smoosh technique was used for the inking. I diecut the sentiment 3 times from black and once from white and glued them in a stack for the card front. When I was done making these backgrounds, I continued to spritz the craft sheet with water and dab a cardstock into it for a bonus background. This one also got a diecut medallion and a pre-printed vellum. Debby used watercolors to paint big dots, letting them barely touch to allow the colors to bleed. She shared the concept of turning them into balloons with a figure to hold the strings. I didn't have a figure to stamp so I hand-drew the little cat. I also created this sentiment with three black and one white diecuts stacked up. Since I didn't stay up till after midnight creating these, I get to actually post them on the day they were made. Day 3 of the Online Card Class featured diecutting. I made just three cards for this lesson. The first combines 1) use of nested circle dies used to cut out rainbow parts along with 2) handfulls of skinny strips mounted vertically to a backing in rainbow order and diecut into a word. Then 3) a cloudy sky background was created with an embossing folder and I cut it apart to layer with the rainbow. Card number two uses more of the nested circle dies for a rainbow and the cloudy sky folder, but without the blue inking. This also uses a diecut sentiment in white made up of 3 layers of cardstock. The last card uses scraps from the narrow strips mounted on cardstock. I used some to cut a sentiment on the diagonal to the stripes, some to hand-cut a cake and candle and the rest to cut plain strips. All were combined on a white card along with one of the rings from the nested circle dies. The biggest lesson I learned was the importance of using waxed paper between the letter dies and the cardstock. The words just fall out instead of having to dig them out of the dies. Day 2 of the Online Card Class I'm taking had it's focus on stamping using rainbow colors. First up was Jennifer with a first- and second-generation rainbow stamped in a grid. I used a chevron heart where she used a solid. 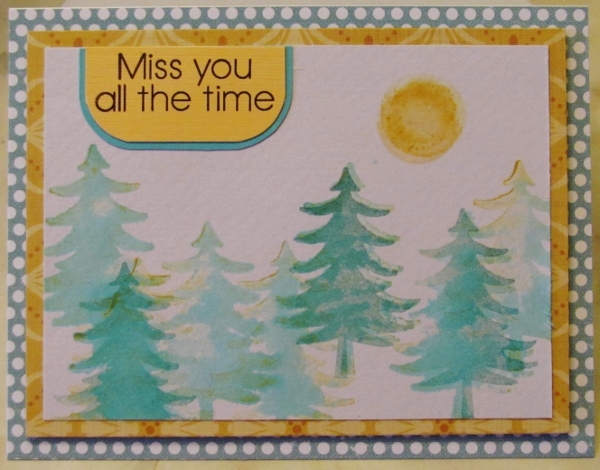 I added three layers of diecut sentiment and a striped background. This was followed by layered stamping, using overlapping colors to create a more complete rainbow. There are actually only 6 colors used on these crayons. The effect is created entirely by stamping one color on top of another.The crayon stamp is one I hand carved years ago. 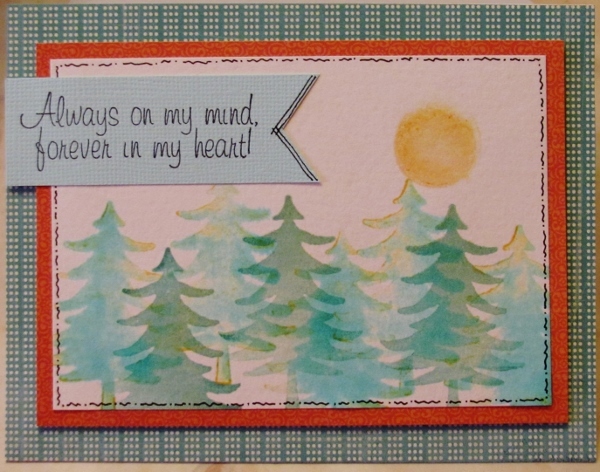 Again, I used a striped background and triple layered diecut sentiment. The instructor, Laura, taught how to make ombre plaid rainbows using three border stamps and blending ink on them. I bordered in black, popped up a color circle and added a triple thick diecut sentiment. Carissa demonstrated several ways of getting a sentiment inked into a rainbow. I didn't use any of her embossing techniques, just straight up inking. I trimmed out the sentiment by hand and mounted it on a black banner strip. Layered over black and white background bordered in coral. I'm liking this rainbow theme! I started an online class yesterday at the Online Card Classes site. This one has a focus on using rainbow coloring. The lessons for the first day (three instructors) taught how to do TWELVE different blending styles and then turned several into finished cards. Mine may use different supplies, a change in style, other finishing and most certainly stamps unlike theirs. We switched from blending tools to stencil brushes for the next one. The color is applied from one edge in rainbow bands. Then a stencil was laid on top and more of the same colors were brushed on. I turned mine so the color was at the bottom and stamped the bottles over it. When stamping the card above I stamped the image again onto a blank card to clean off the stamp. Then I used the image to clean off my stencil brushes and it gave me this soft image. I stamped a black sentiment over the top and finished with rhinestones. On this, rather than using a whole rainbow of colors, it uses only red yellow and blue. All the secondary colors are from blending these. It has been flecked with water to create the mottled effect. One of the lessons was creating a stripedy background using the edges of thepads of pigment inks. I, on the other hand, used my Distress Inks. As I added more color it was leaning toward the orange so I finished going in that direction and created a sunset sky instead of a rainbow. The skyline is a stencil that I inked with Archival black. Finally, I stamped those bottles again and used the direct-to-paper technique to spot-color them. ...and that was day ONE! For my last card for this class I used a version of the stencils and Copics technique. On white cardstock I used a birch tree stencil and a foam dauber to ink in the trunks. I used a W3 Copic marker to shade the left side of the trees. Then I cut out trunks to use later. 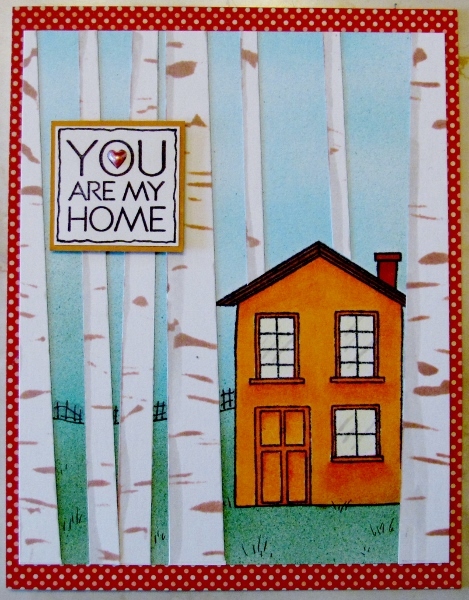 I stamped a house on white cardstock and colored with Copic markers and shading. I created a mask of the house and covered it while I used blue and green Copic markers in an airbrush system to make sky and ground. I glued the trees in front of the house and added some partial trunks against the roofline. I used a fine marker to add a little fence and a few sprouts of grass. The panel was trimmed to size and bordered with patterned red cardstock. I stamped a sentiment block and mounted it with foam tape. At the end I used Liquid Pearls to fill in the heart in the sentiment. So, have you been keeping track of how many cards I made for class? A total of SIXTY THREE! Tomorrow will definitely be something different. The technique used for this card was a focus on stencils and Copic Markers. On white cardstock I used a tree stencil and a foam dauber to ink in branches. I slightly offset the stencil and inked with another brown to create some depth. Then I used a fine line marker to sketch in the tree trunks and branches. I used a W3 Copic marker to shade the left and bottom of the branches. I used blue and green Copic markers in the airbrush system to make the sky and ground then used a dauber with yellow ink to make the sun. I used a black marker to border the panel. 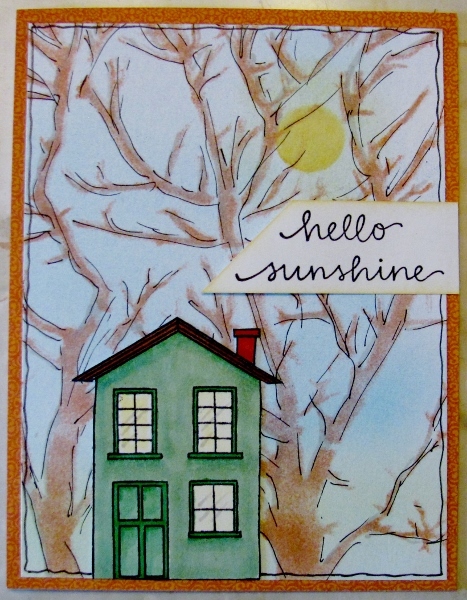 I stamped a house on white cardstock and colored with Copic markers. This was cut out and glued to the stenciled background. I bordered it with patterned dark orange. 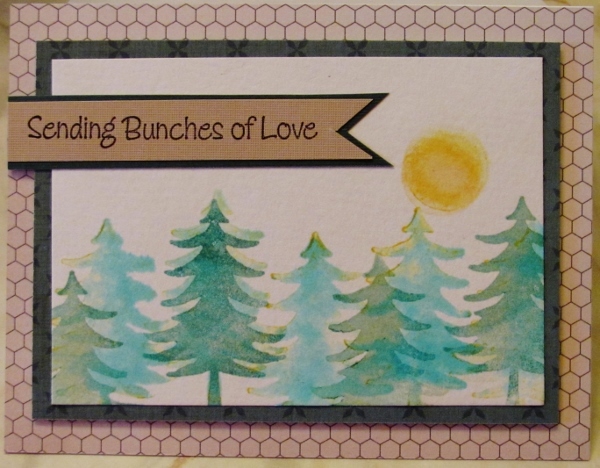 I stamped a sentiment strip, inked its edges in yellow and mounted it with foam tape. 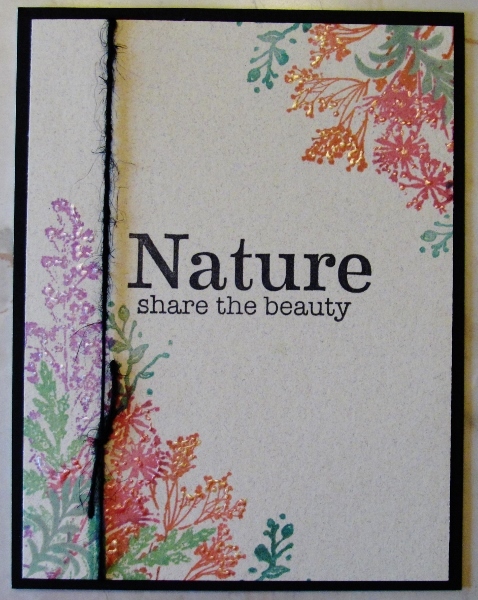 The first technique shared on day 11 of class was called Layered Heat Embossing. I made 4 cards with this technique. First I cut piece of tagboard and inked the edges with Versamark and dipped them in silver embossing powder. I melted this with a heat gun. Then I covered the face of the chipboard with Versamark. I covered this with and silver embossing powder and heated it. This was repeated to get even coverage. I used the anti-static bag on the piece. Then I stamped the flag with Versamark and sprinkled on cherry red embossing powder. this was heated carefully to melt only the red. 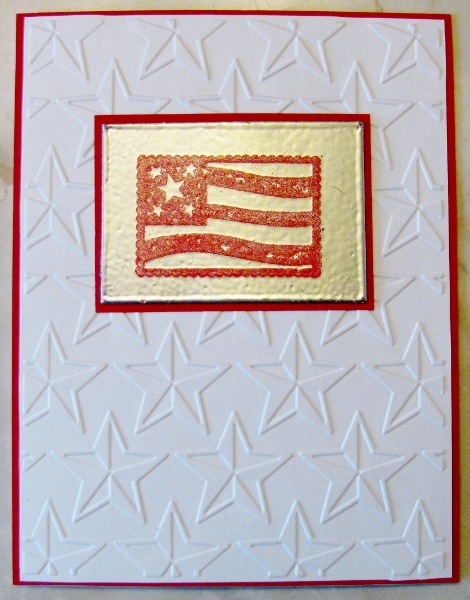 I bordered with red cardstock and layered it on white cardstock which was dry embossed with a star folder. I used the same process to creare a gold and red block and layered it on silver cardstock bordered in red. The next panel was embossed with silver and gold which was layered on a gold cardstock embossed with a frame folder. Oh, my. 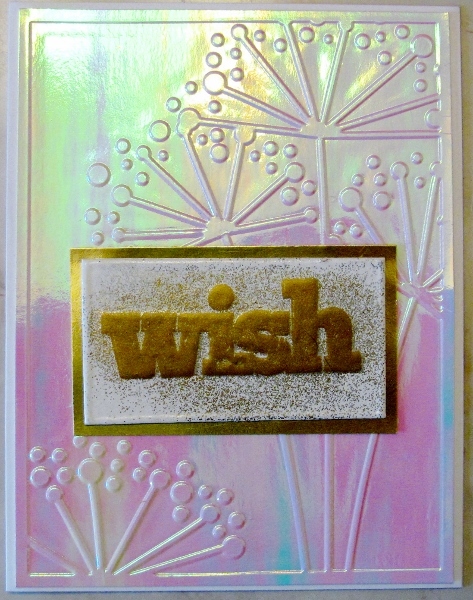 The white embossing powder used on the next block stayed slightly sticky so some of the powder stuck to the background. 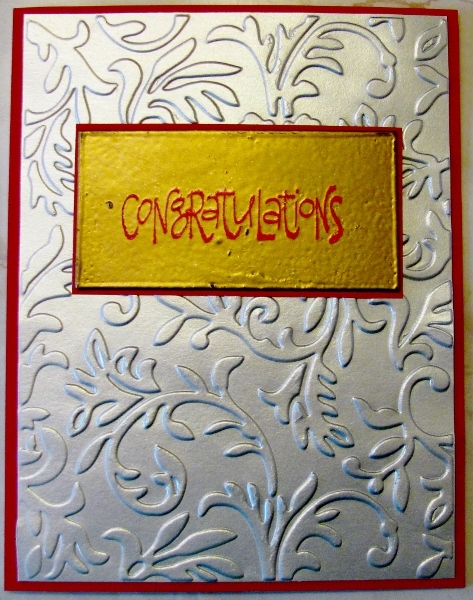 I embossed the stamping in silver first and it wasn't enough contrast to I stamped over that with gold. 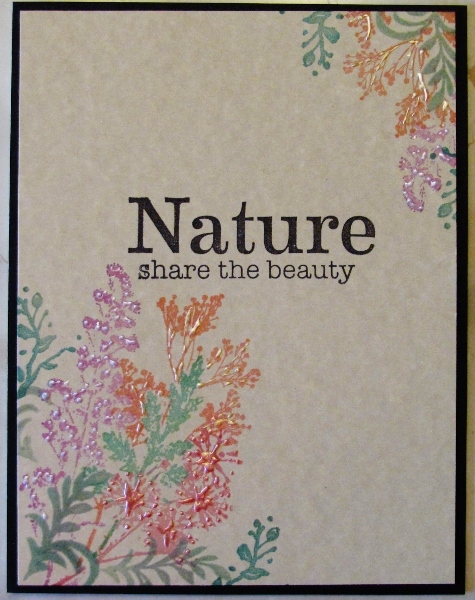 I chose an irridescent cardstock to emboss with a dandelion folder for the background. I can't see using this technique again. Well... maybe. The next technique I tried from the day 10 class was Light Embossing on Dark Cardstock. This first card was the 'test piece' for the technique. 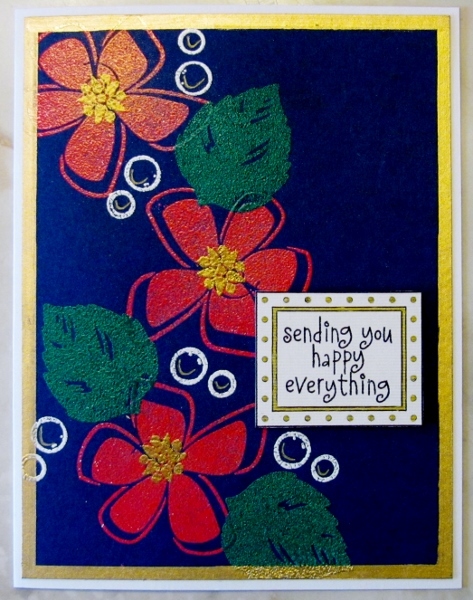 I selected navy cardstock and stamped flowers in white pigment ink and embossed with cherry red. 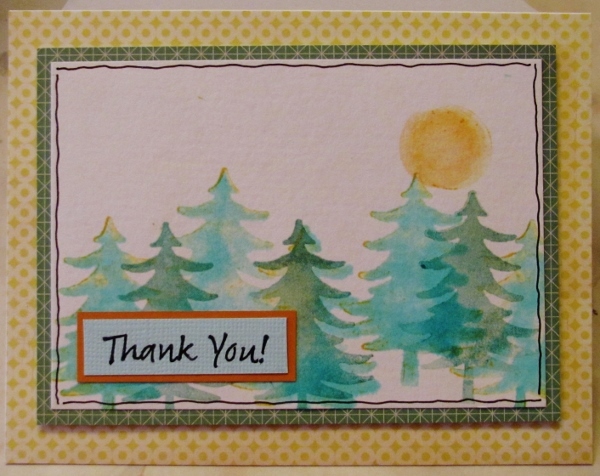 I stamped leaves with white pigment ink and embossed with Christmas green. I stamped berries with white pigment ink and embossed with white. The colors were not very vivid so I went over them with Copic markers, changing the white berries to yellow. I trimmed the panel and mounted it to pink bordering card and a blue printed layer. 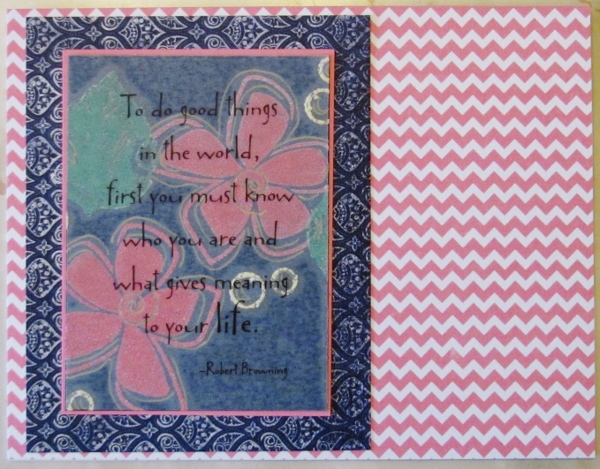 I added this to some pink chevron cardstock over a card base. I was not liking this too much so I used a gold gel marker to add some sketch lines on the navy background. Still not impressed with the look of it so I found a vellum pre-printed quote and trimmed it to the exact size of the flower layer. I ran this through the Xyron machine to coat the back with adhesive. The vellum was adhered to the panel and burnished to allow the flowers to show through. OK, back to following the instructions! For the next card I did the stamping in Versamark! Stamped flowers and embossed with cherry red. Stamped leaves and embossed with Christmas green. Stamped the berries and embossed with white. Stamped the flower centers and embossed with gold. MUCH better result. I trimmed the panel and used a gold Krylon paint pen to band all four edges. I mounted this to a white card base. I stamped a sentiment block on white and trimmed it. I used a gold gel marker to fill in the dots and lines then mounted it on the card front with foam tape. Day 10 of class started out by using the floral silhouettes as... underwater plants and corals. One of the secrets to success is in the choice of color palette. I traced a circle on white cardstock then used 2 dye inks and 2 chalk inks to stamp 4 silhouette floral 'sprigs' leaving white space at the top. 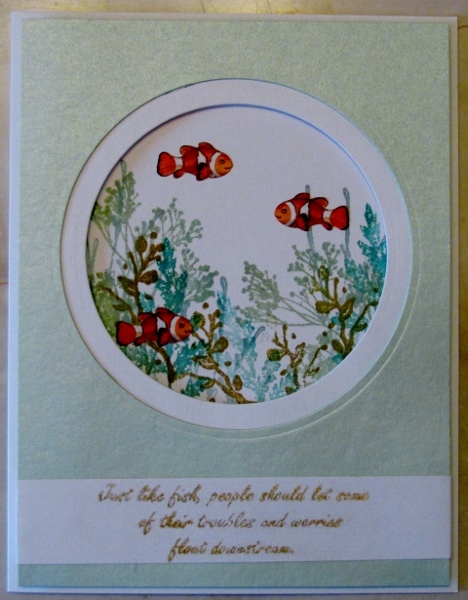 I diecut a circle in another white cardstock and a larger circle in green shimmer cardstock. 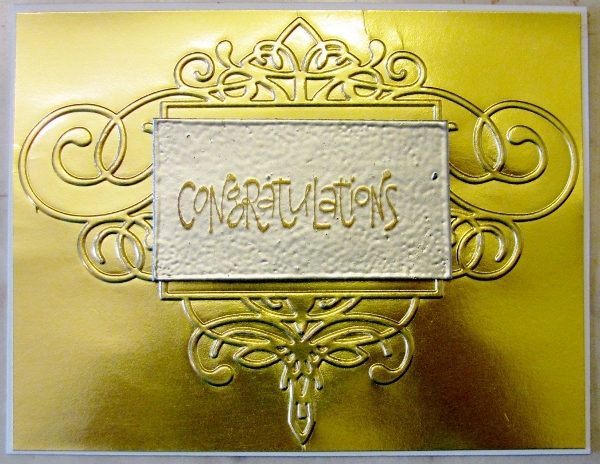 I embossed a sentiment in gold on white cardstock, trimmed and mounted it as a band on the green layer. The diecut layers are glued together and mounted with foam tape over the stamped layer. Three clown fish from a sticker sheet were placed in the undersea scene. The second card is similar but has a few changes to note. I used a darker green cardstock, added a gold edging to the sentiment strip using Krylon paint pen, and used holographic fish stickers. You can see that the colors I chose have a bluish cast and are lighter in the background and gradually get greener and darker as the foliage comes forward. The third technique from day 9 was an experiment fail for me. It needed 'coated' cardstock and a wet dye ink neither of which I had. It also used florals and foliage that actually went together which I also did not have. The technique was to ink the stamp, press to the coated cardstock and twist it slightly to create a painterly look. My stamps/inks would stick to the paper and not allow me to twist them so the images were clear and not in the least painted looking. 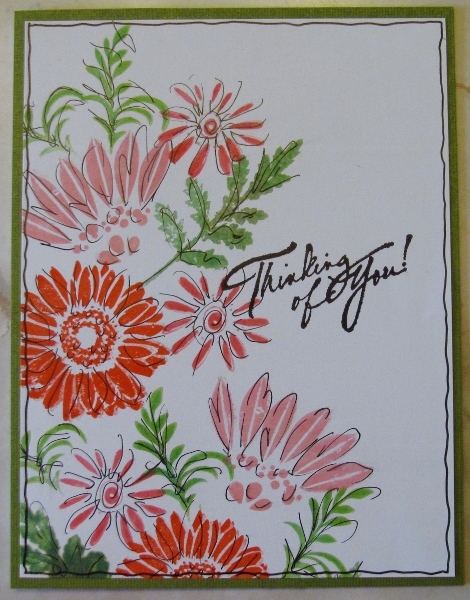 I stamped three daisy style flowers each in different ink. Then I stamped two leaf types. we were then to use a fine black marker to sketch in some lines to lend a more hand designed look to the stamping - not so regimented. I stamped all three with different sentiments in black. On the first two I drew a black border on the panel and mounted them to green cardstock. The third one got a solid sentiment block and a black background. The black border negated the need for a drawn border on this one. For the second technique on day 9 we used a lot of masking. I selected sprigs and grasses (most look like weeds to me) and stamped them on sticky notes. These were cut out and used in series to create bouquets in the lower left and upper right corners. Each stamp was stamped using a different color. I stamped a large sentiment on the card and mounted to black cardstock for a border. Each card got three colors of Liquid Pearls decorating the flowers. On the first card I boo-booed on one of the stems so I covered it by tying black twine over it. Each of the three cards was made with a slightly different shade of Kraft cardstock. This background actually has a bit of a parchment look to it. These masks were very fiddly to cut and the result was not so awesome that I'd use them again. I decided to use them up by making all three cards at once and just be done with it. Day 9 of the Stretch Your Stamps 2 class used floral silhouette stamps including sprigs, branches, leaves and 'build a bloom' or 'build a bouquet'. Well, do I have any of these? Not in sets. But by going through ALL ov my clear stamp sets I was able to find a bloom here - a leaf there - a branch elsewhere... and managed to bring together enough to do three of the lessons. 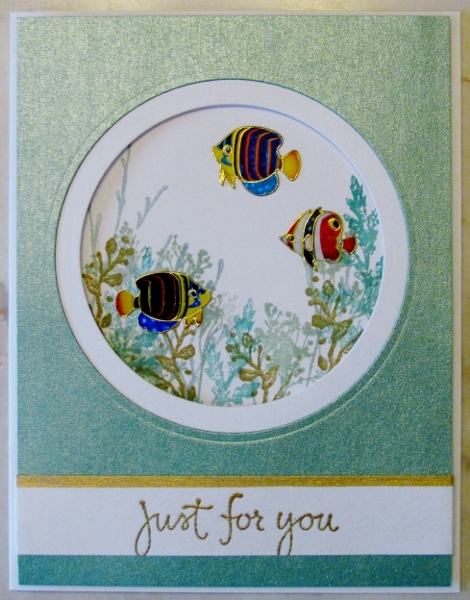 First was a CASE of a card by Julie Ebersole. 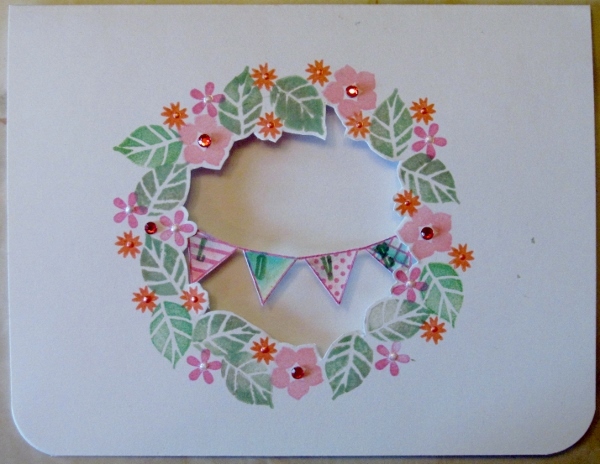 This begins with tracing a circle on the front of a card and stamping around it with leaves in two colors and three sizes of blooms in three colors. The center of the resulting wreath is cut out with sharp scissors. A banner was stamped and cut out then glued into the wreath from the back. I used liquid pearls and rhinestones for the flower centers. The third technique I used from day 8 of class was wet-on-dry stamping onto watercolor paper with graphic stamps. 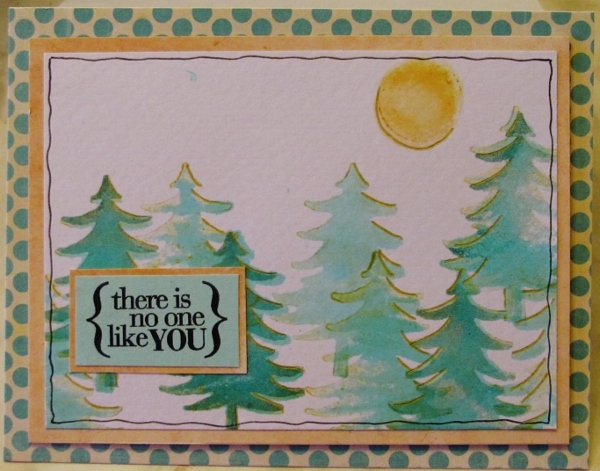 I chose a solid evergreen tree image to use and laid out five pieces of watercolor paper to use. I pressed two different green die inks (Whispers brand) onto my craft sheet and spritzed with water. The tree stamp was pressed into the wet ink and stamped onto dry watercolor paper. I stamped repeatedly, inking after each impression. A third green was used to ink the stamp directly and stamp over the trees I wanted to appear to be in the foreground. I used the same process with straw ink to stamp the sun. When the panels were dry I trimmed them and layered with printed papers and one layer of foam tape. 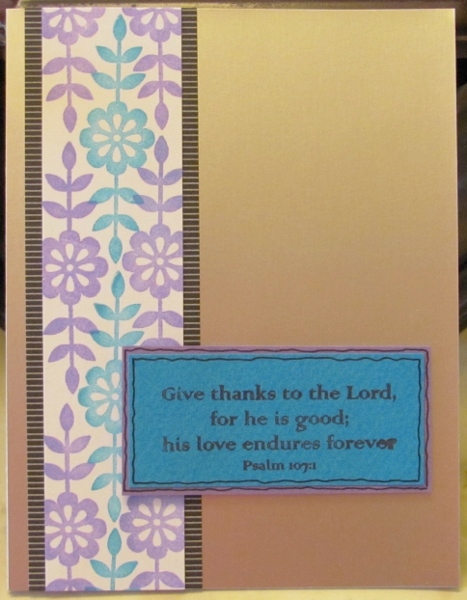 For the first card I used a teal dot for the background and a golden pattern for the bordering. 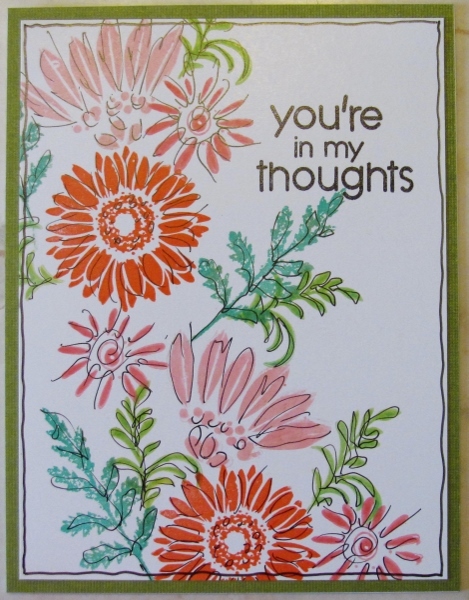 The sentiment is stamped on a golden cardstock with two rounded corners. This was bordered in teal and aligned with the upper edge. I next used a yellow-green diamond background and a green graphic border. I used a fine line black marker to add a doodle line on the panel and mounted an aqua sentiment over a rust border. The third card uses a teal dot background and a rust border. An aqua sentiment got a a banner end enhanced with lines and the panel got a broken doodle line in black. Then I mounted a panel on a honeycomb background with a muted green border. The sentiment was cut with a banner end and bordered in green. Where it overhangs the left edge of the panel I used foam tape to raise it to the same level. The final card with this technique got a medium dot teal background and a mottled border. I used gold gel pen to create a glint on the tree branches where they catch the light of the sun. The sun also got a bit of gold pen on the bottom rim. A fine black doodle line was drawn around the panel. The sentiment was stamped on aqua, bordered in mottled cardstock and adhered to the front of the panel. The next technique I tried from day 8 was to use a single graphic stamp to create a repeating border. I used two inks - purple and teal - and selected three different stamps so I could make some different designs. In each case I drew a light line in pencil to keep the center aligned. I stamped down this line with teal ink, using a stamp positioner whenever the stamp was a wood mount (2 of them were). Then I used the purple ink to stamp an offset of the same stamp up each side. For the first card I used a rather scroll-y stamp which lent itself to a more tailored treatment. I trimmed the panel, bordered it with purple and mounted it on a black striped background. 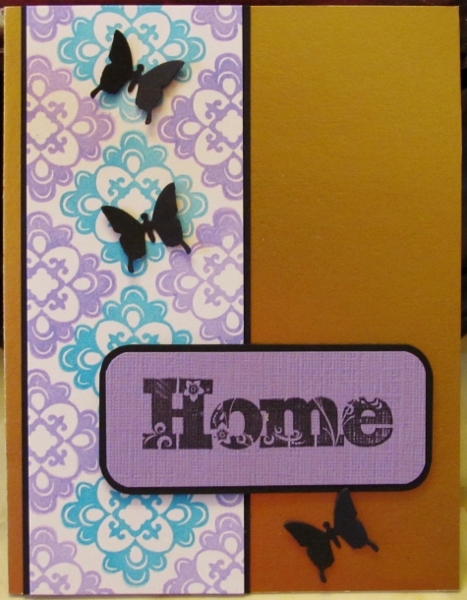 I stamped a sentiment on teal, bordered it with black and purple then popped it up on foam tape. The second stamp I used was a lineal floral. This created a narrower border which I gave a wider border of black striped paper. I used this panel on the left side of a shiny silver background. 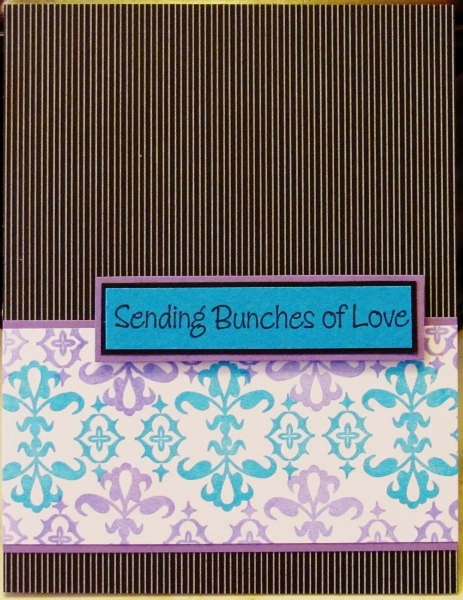 The sentiment was stamped on teal and bordered with purple and got popped up on foam. A thin black border was created with black marker. The final card with this technique used a graphic square set on point. I bordered the panel in black and mounted it on the left side of a shiny gold background. The sentiment was stamped on purple and the corners rounded before bordering in black and popping up on foam tape. Three butterflies were punched from black cardstock and mounted with the wings raised. The first technique on day 8 was to use graphic stamps in a repeating ombre design. 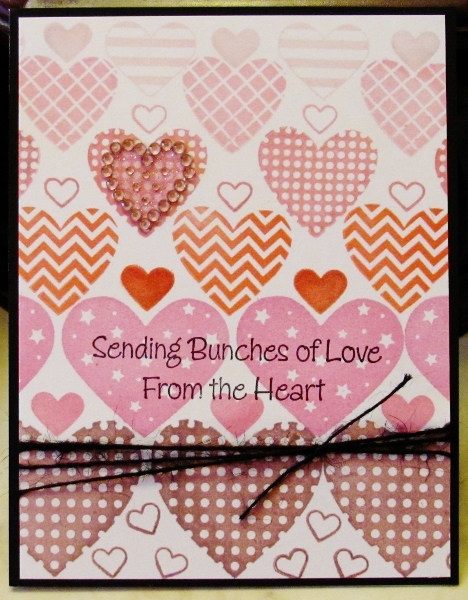 I selected 8 graphic heart stamps from different clear sets and chose 6 pink/red dye inks (Whispers brand). I began with the large bottom heart to get an alignment that would not overlap. I worked my way upward with just the large hearts in each line using successively lighter inks. After all lines were done I went back and used different smaller hearts to fill in the open areas. I had a rhinestone filled heart sticker and applied that to one of the stamped hearts in row three. I stamped a sentiment with black, tied three rounds of black twine around the base and mounted with a thin black border. The last technique of day 7 is also a kissing of stamps but in a different way. The plan is to use the kissing to ADD ink pattern instead of SUBTRACTING it. I call this Kissing On. I inked the solid quilt stamp with die ink and stamped on white cardstock. 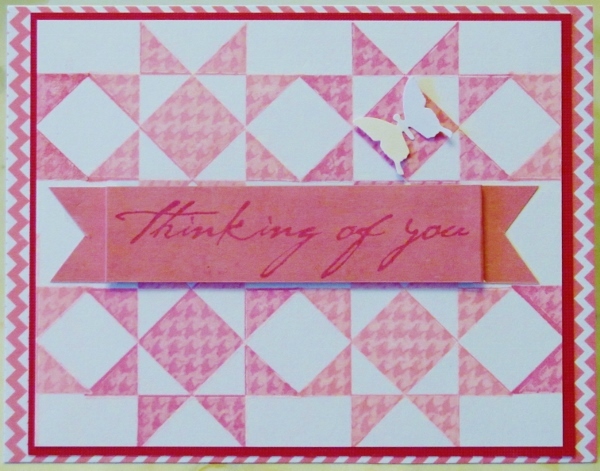 I used two different pink inks to create variety and arranged a bunch of them to make a large pattern. I inked a houndstooth background stamp with white pigment ink and pressed the quilt stamp onto it before pressing onto the already-stamped pink blocks. I trimmed and bordered the panel with dark pink before adding to a pink chevron background. The stamped sentiment was scored and folded so the fishtail ends tuck behind. The center is popped up on foam tape and the ends are glued to the background. One white butterfly is added with the wings raised. For this Kiss Off technique I inked a solid quilt stamp with die ink and pressed it to a houndstooth background stamp before pressing to white cardstock. This removes part of the ink so a pattern appears inside the solid stamped area. I used two different coral inks to create variety and arranged four of them to enlarge the pattern. I even liked the test stamp so cut that out to use on a separate layer, bordered with black and popped up on foam. I bordered the main panel with black and mounted this on a white card base. I call this card 'A Flower in Parentheses'. For the class on day 7 we were using stamps called 'graphics'. These have solid areas and are usually geometric. I found a set in my collection that was all oversized punctuation marks and decided to use those. I arranged two different sizes of parentheses facing each other on a clear block. Then I used straw ink to stamp a circle of them, overlapping as I went around. I came back with a third parentheses stamp, this one more open, and filled in the spaces. I used sage ink with a set of quote marks to construct leaves and added some yellow-green to them by overstamping. I used the largest parenthesis to make a stem. I gave all the petals and leaves a drop-shadow with black marker. Trimmed and bordered the panel in black and added it to a floral background. Colored a small daisy diecut with black marker and stuck to center. Added a champagne rhinestone. Bordered a sentiment with black and popped up on foam tape. Then I made a card I call 'A Mum in Quotes'. 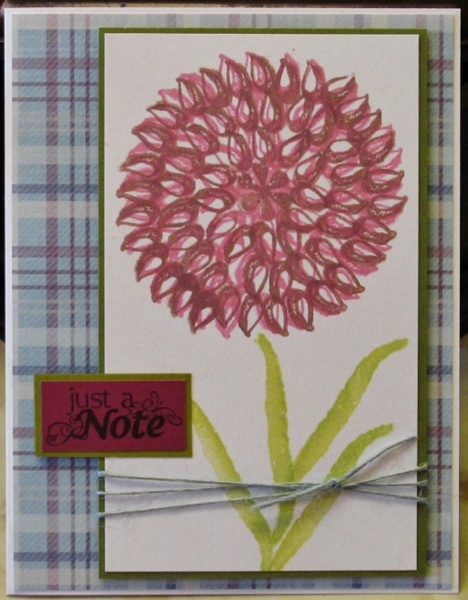 I used a quotation mark stamp to create a mum on white cardstock, using two inks. I stamped a solid daisy in the center. I used parenthesis, stretched straight, to stamp a stem and leaves. Then I trimmed and bordered the panel in green. I wrapped the panel with blue twine and layered it on blue plaid background using foam tape. I bordered and added a stamped sentiment with its left side on foam tape and the right side on the panel.